Installation and performances at Matteawan Gallery residency, February 2015. Beacon, New York. With guest artist Nick Holmes. Drawing upon romanticized American ideals of remote solitude in nature, the 200 square-foot gallery becomes a site of a deconstructed cabin. Neon, furs, wigs, pineapple, and wood are used as ritual textures and objects, embodying and contradicting the notion of the one-room interior winter cabin of colonial lore. Long held in the mind of artists and writers as an essential psychic space for both healing and creation, I deconstruct and reimagine its essential qualities through a feminist and post-colonial lens. For the final, durational performance, audience members remove their shoes before entering the space. 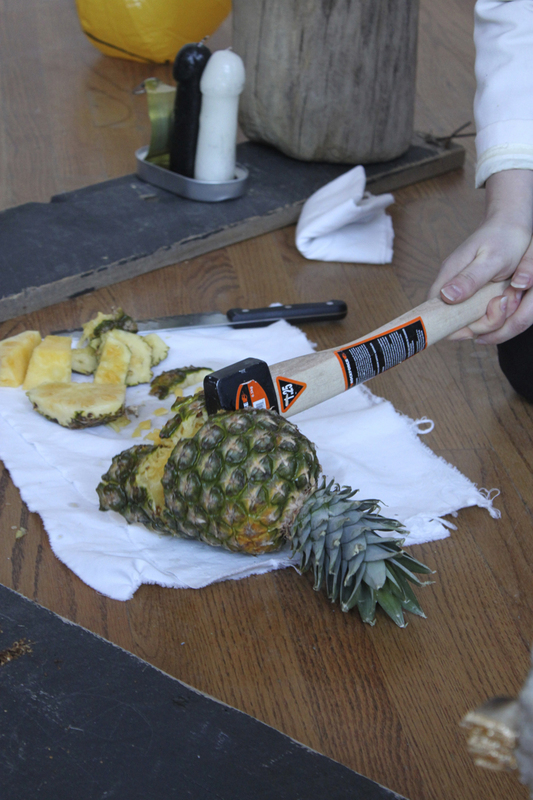 I chop pineapple with a hatchet on the floor and offer pieces to the audience. They are invited into an informal dialogue with myself and the other gallery visitors. Prompts include reviewing nature solitude as an historically male space for creativity (Hemingway, Melville, Thoreau); and how the lone woman in nature is perceived as mythic monster (the Puritan witches; Baba Yaga).